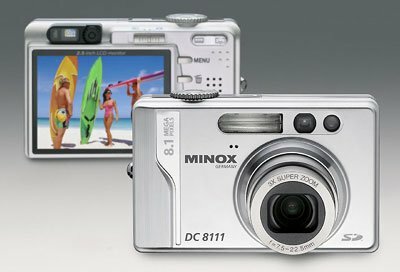 Boasting high quality digital performance the new DC 8111 from MINOX of Wetzlar is an 8 megapixel compact camera that sets a new direction in the combination of design, size, features and performance. A CCD sensor with a resolution of 8.1 million pixels, built into the elegant aluminium body, combines with the fast multicoated MINOCTAR lens to produce superb quality digital images. Add autofocus, a 3x optical and 5.1x digital zoom, automatic exposure and manual control and you have a fully featured compact and elegant creative digital camera. The oversized 2.5" colour monitor on the back of the camera is based on state of the art LTPS-TFT technology and is another major feature of this camera that gives a brilliant and sharp image display that enables the photographer to compose the picture with ease prior to pressing the release button and then to immediately assess the shot that's been taken. Due to its generous size its possible for several people to view the shot from different angles without interfering glare, even when in bright sunlight. Yet in spite of the small size of the body the DC 8111 also boasts a convenient optical viewfinder. Natural colour rendition of the images is obtained through the perfect coordination of the image sensor, lens, electronics, and software components. The user can enjoy full creative freedom by selecting a manual mode – for night time, sport, portrait or even macro shots from a distance of just five centimetres. This is also where the freely selectable apertures and shutter speeds come into play. An automatic white balance also provides the optimal exposure, providing natural colors and the correct setting for the subject in view. Four different flash functions make use of the best available lighting conditions for the best use of flash at all times. A fast image sequence and minimal shutter release delay allow spontaneous snapshots under all conditions. This makes this new compact camera from MINOX an attractive product, not only for the production of top quality snapshots, but also as a particularly desirable camera for discerning and serious amateur photographers. An added user feature is the option to make video clips and voice recordings. Besides adding personal comments to digital pictures this feature allows the recording of entire video films. The length of these is just limited by the capacity of the storage medium in use. For recording and playback operation there is a microphone and speaker built into the body of the DC 8111. The SD card with up to 1 GB capacity serves as memory and the power supply is from a Li-Ion battery. Fast and uncomplicated transfer of the image files to the computer can be carried out via the digital USB interface on the DC 8111. With the provided software pictures can be touched up on the PC and then forwarded on to friends and family. The camera comes complete with a Li-Ion battery, SD card (64 MB), case, wrist strap, USB and video cable, CD-ROM and manual.